OK, I’ll admit it, I like Americanized Chinese food. I love authentic Chinese food but with just a touch of sweetness. Not a jawbone ringing sweetness, just a touch. It doesn’t necessarily have to balance the dish, unless it’s supposed to. A simple wave from the wings will do me just fine most of the time. This is not one of those times. Another admission; I *LOVE* Safeway’s sesame chicken. There, I said it. I love, above all others, the most white bread American supermarket on the continent’s (no matter what they decorate it like) deli sesame chicken. This is why I developed this recipe. I’m far too proud to ask an establishment for their secrets. Although many will provide them upon request, I’d much rather develop a recipe by making it four or five times and perfecting it with every revision. This applies to nearly all recipes you will see right here in Foxfurville. If you loosely follow my recipes I can guarantee arrival at the fifth plateau of NOM! Safeway’s sesame chicken is characterized by its sticky and sweet coating of yummy sauce and whole sesame seeds. It is pretty damned close to “Oh hell, I’d better book a visit to the dentist” sweet. I can’t eat it on a regular basis, nor would I want to, but as an occasional treat it’s a kick in the pants free-for-all that fits rather nicely in your mouth. What I ended up developing is a more savory version; a perfect balance of sweet and salty with a savory edge that will bring tears of joy cascading forth from your salivary glands. Just see if it don’t! BTW, you won’t find cilantro in Safeway’s version. This was suggested by Sweetpea and is key in sending the dish into low earth orbit. I recently scored a deep fryer. Holy cow, folks! It’s now my favorite implement of culinary devastation in the continuing war against empty tummies. I limit its use to once or twice a week, three when developing new weapons of mass deliciousness. If you don’t have one you can use a wok, dutch oven, or big rig hubcap (automobile hubcaps are too shallow). There are many ways to grind sesame seeds. I have a suribachi (Japanese mortar & pestle) but rarely use it for the seeds unless I’m incorporating other stuff in with them. I also have a Japanese handheld grinder / dispenser but it doesn’t give the mashy, pasty texture that I like for this recipe. For this I use one of two field expedient Macguyver methods. The first is with two spoons. Put a small amount of seeds in a spoon and mash with another spoon. Simple. The one that I prefer is to use a small stainless steel measuring cup (mine is a 1/8 C) and the end of the handle of an old Eklund bottle opener. It’s a good old fashioned maple handled dinosaur from the 1950’s that I inherited from my grandmother. Drop the seeds in the cup and beat and grind the hell out of them. Mix up the marinade / batter and set bu your cutting board. Dismember the chicken into 1/2 to 3/4 inch chunks and toss them in the marinade. Let the chicken rest in the goo until they coo with relaxed little clucks, about 30 minutes. While they’re relaxing, mix up the sauce. Set aside. Heat your oil to 350 – 360 deg F.
Use a thermometer or chopstick (will bubble at the tip when at proper temp) to know when you get there. Using a fork, stab the chicken one piece at a time and drop in from as low an altitude as possible. No Bellyflops! You’ll want to do this in batches of 7 – 9 pieces. Don’t crowd the pond, chickens aren’t social swimmers. Fry until a straw or golden brown color. Cut open a piece from the first batch. Pink means it’s medium rare, not good. Throw her back in the pool for another minute. I drain mine using two paper towels atop a brown paper grocery sack. transfer to a paper plate lined with paper towels between batches. Drop chicken in oil, remove to towel / bag, drop in more chicken, move drained chunks to plate. Once all the chickens have had their turn, heat up a frying pan or skillet on medium-high heat. Dump the chicken into the pan and heat, stirring and shaking every 10 – 15 seconds until they’re good and hot. Turn down to medium. Now pour in about 2 TBSP of the sauce. Stir around to coat the pieces and let it cook down to a sticky goop. Don’t let it burn. Now shake in 2 more TBSP of sesame seeds. When it gets goopy go ahead and dump another 2 TBSP in and do the same. You can actually do this with all of the sauce and end up with chunks so sticky that they’ll stick upside down to the range hood. I’ve done this and Foxfur was amused. I’ll pour and goop 2 – 3 times otherwise it gets too sticky. Dump in the drained pineapple, cook for about 30 seconds, then flood with the remaining sauce. Cook down a bit until it reaches your ideal thickness or add a bit of cornstarch water to thicken it up. Serve over rice, sprinkle with cilantro and enjoy! This stuff is finger lickin’, molar stickin’ good. This entry was posted in Cooking and tagged Chicken, Chicken recipes, Chinese food, Cilantro, Deep-fried food, Safeway, Sesame seeds by Foxfur. Bookmark the permalink. I like the idea of balancing the sweet with savory. Thanks for the recipe! Google “Springfield Cashew Chicken” sometime and give it a whirl; there’s no sweet involved, but since you have a deep fryer, why not? It’s a regional dish from Springfield, MO…can’t find it anywhere else, really, but it’s so flipping good!!! 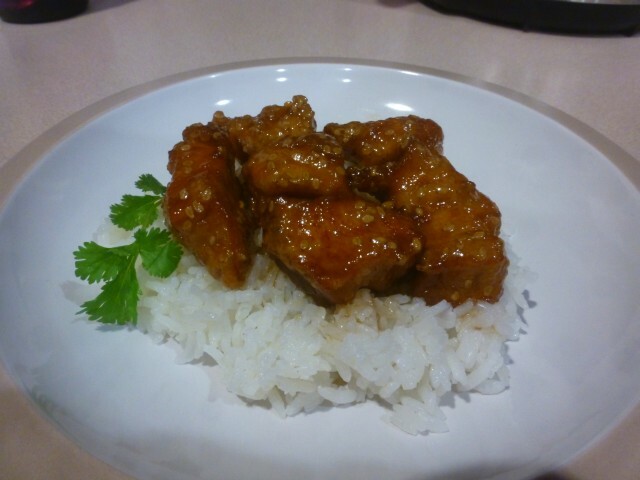 I love Safeway sesame chicken too, and I’ve been looking for a recipe for it. Your instructions are a little confusing. You don’t cook the sauce before you start adding it? If you don’t pre-cook it, it seems like #1, you’d get your chicken breading really wet, and #2 you’d have to cook the be-jesus out of the chicken to get the sauce to turn sticky……..or am I missing something here? I’d love to hear from you. The sauce cooks down faster than you’d think, it was arrived at by testing many techniques but this one works best for the recipe.